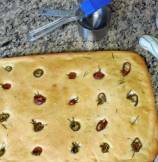 Keeping my promise, I am sharing with you Jalapeno Focaccia recipe today. Am I the only one who considers making bread at home a success story? For a long time, just the simple idea of baking would send me into a tizzy. It’s true!! It’s not that I create recipes so I can do any kind of food. Baking good, homemade, soft and moist bread is an achievement at all level. I need to test recipes after recipes to reach there. Today’s recipe was a homemade success story at many levels. I used homemade pickled Jalapenos and home grown (kept frozen) rosemary. My husband won’t let me buy an olive press or otherwise I would have used homemade olive oil as well. Lol!! 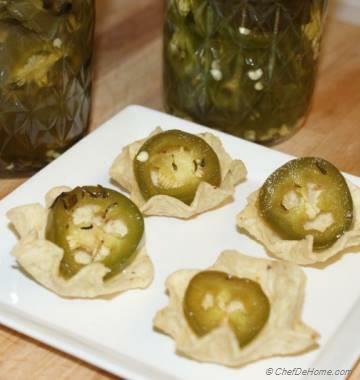 I shared Jalapeno Pickle recipe last year and I must say pickled and canned Jalapenos comes in handy whenever I need’em. 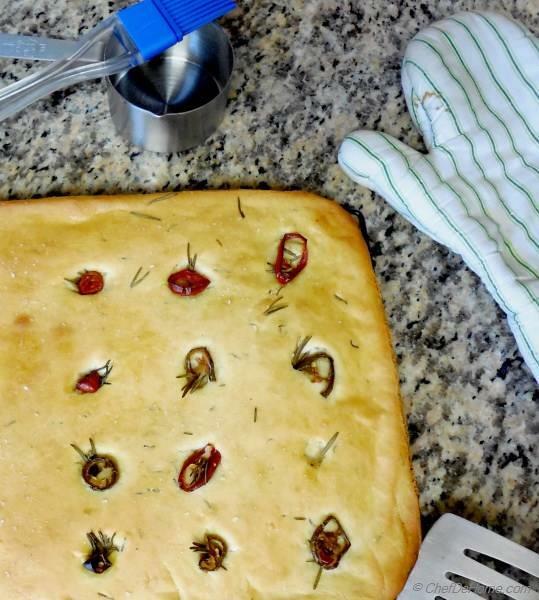 Like today, for focaccia. 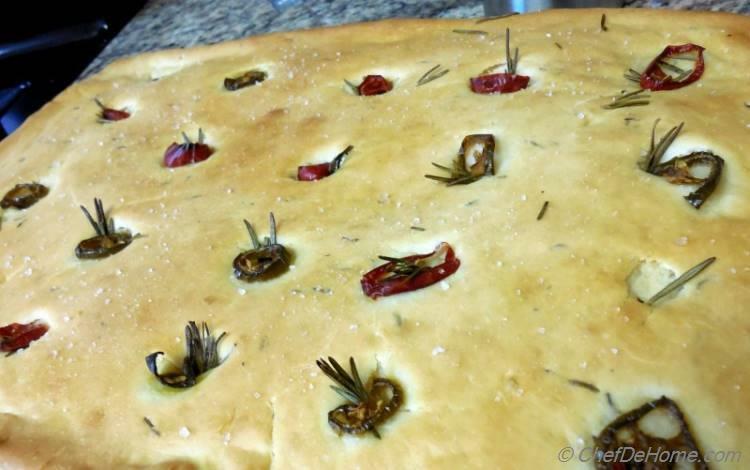 Basic bread recipe is the same, Focaccia perfumed with olive oil and rosemary and slightly charred pickled jalapenos on top really change the dimensions of Focaccia Slice. You don’t even need a spread or dipping sauce for this bread, just slice and serve. Scrumptious!! 1. Spread yeast and 1 pinch sugar in 1/2 cup lukewarm water and let it foam up for 10 minutes stir once in between. In a mixer with dough hook attached, add olive oil, chopped rosemary, remaining 1/2 cup lukewarm water, yeast mixture, salt and sugar. Add 2 cups flour. 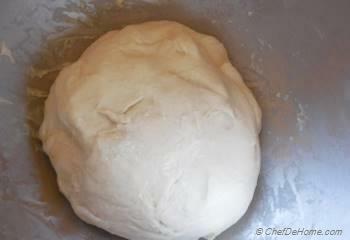 Knead till sticky dough forms. Now add ¼ cup flour at a time till dough comes together and make slightly sticky ball (about 5 minutes) At this stage knead for additional 4-5 minutes. Transfer dough to an oiled bowl, turn upside down, so that dough is completely covered with oil and leave covered for 20 minutes. 2. 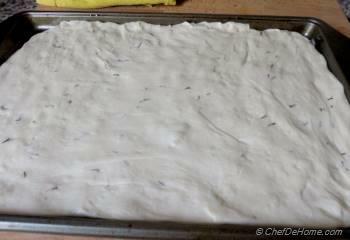 Oil a rimmed baking sheet, transfer the dough to sheet and with oiled hands press it gently to fit in rimmed sheets. Cover with oiled plastic sheet or kitchen towel and leave to rise (till it doubles in size) in warm dark place – about 1 and ½ hour. 3. Set the oven to preheat at 425 F. Remove plastic sheet or kitchen towel from risen dough, make indents with your finger all over the dough. Brush with 1 tbsp of oil and sprinkle some coarse pink salt flakes. Stud slices of pickles jalapenos and rosemary. Bake in middle rack at 425 F temperatures for 20-25 minutes till bread leaves side of rimmed sheet and is slightly golden on the top. Let cool down for 10 minutes then shift to wire rack for complete cooling. 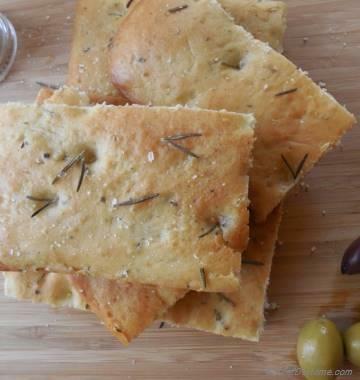 Thanks everyone, glad to know you like Jalapeno Focaccia. This is my weekend baking project. Thanks for recipe. I often make Focaccia at home with cherry tomatoes and onions. 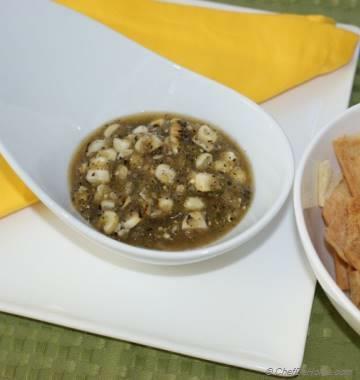 Jalapeno will be a great idea too.